With music, dance and games, children from four Catholic community schools in Baltimore gathered May 9 to celebrate their being the first “Plank Scholars,” a new part of Partners in Excellence (PIE). Second-, third- and fourth-graders from Archbishop Borders, Cardinal Shehan, Holy Angels and Ss. James and John Schools assembled at Under Armour House at Fayette, a community center in east Baltimore. 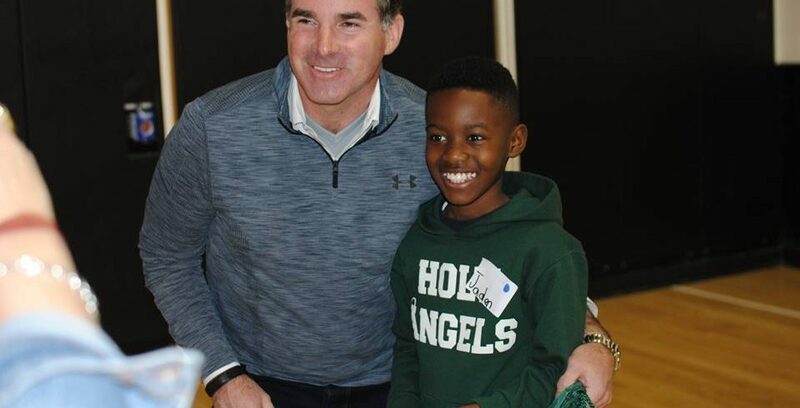 “I’m glad to have you all here today,” said Kevin Plank, Under Armour’s founder, in welcoming the 83 Plank Scholars, the first recipients of scholarships funded in part by a $1 million grant Plank gave the Archdiocese of Baltimore program last September. This was the first time Plank had an opportunity to meet with the children. He quizzed them on their math skills and expressed delight as they shouted out the answers to multiplication and division questions. “So it appears this whole Catholic education thing works,” he quipped. Plank urged the students to keep up the good work. “Study hard, keep working, believe, believe, believe,” he said. He blessed them before they divided up for a morning of music, art, dance, basketball, volleyball and entrepreneurship. It was quiet in the music room, as children wearing headphones put together musical compositions on Mac computers. The whole group listened to a driving beat composed by Riley Rivera, a fourth-grader at Archbishop Borders. “I was messing around,” he said, a smile on his face. Plank’s pledge funds scholarships at four community schools which serve children from low-income families, according to Matthew Anthony, director of PIE, which has awarded more than 25,000 scholarships, worth more than $29 million, to children from low-income families in the past 20 years. “He’s known for saying he invest in what works,” Anthony said of Plank. Camille Brown, associate superintendent of Catholic schools, looked on with delight as children swayed to the music in the Dance Room.